Another Radio Caroline North weekend broadcast has now sadly ended. They were on air over the Easter weekend starting from 9am Good Friday right through until 2pm Easter Monday. They were online, and on the 648 AM service and also on Manx Radio 1368 AM. All this was live on board their iconic radio ship the Ross Revenge. They had a annual Easter Fundraiser celebrating their 55th birthday. This year, they created a stylish Radio Caroline Bell tee-shirt, based on a design that was originally used for the Radio Caroline Roadshows. So if you made a one off donation of £25 or more, or joined the Radio Caroline Support Group (for a minimum monthly donation of £7.50, cancellable at any time), you will be sent a Retro Radio Caroline Bell tee-shirt. Radio Caroline North from Ross Revenge will be back again soon over the weekend 11th/12th May. A maintenance crew was on board the Ross Revenge on 13th to 14th April consisting of Mike Webb, George Scullion, Roland Beaney, Mark Eden, Nick Farrant, Steve Swallow, Derek May and KEITH STIMPSON. "ALBERT HOOD is retiring from Radio Caroline on Thursday 4th April, his 80th birthday. Albert and Georgena have tirelessly supported the station for more than 40 years. Most crucially running essential food and supplies out to the 'Mi Amigo' and 'Ross Revenge' at a time when to do so risked imprisonment or large fines. Over recent years they have been running the web shop and selling merchandise at shows. 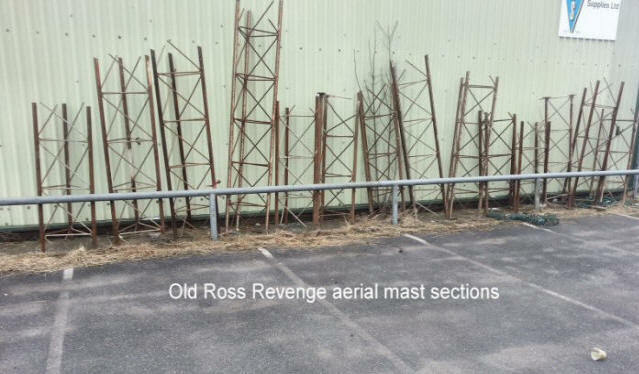 Albert also started the official trips out to Ross Revenge. It is fair to say that without their support Radio Caroline would not be where we are today. You are invited to join us in thanking Albert and Georgena for all their efforts and to wish them well at a gathering on SATURDAY 25TH MAY, 12 noon, at THE SPEAK EASY BAR in Epping, Essex - a bar with a Radio Caroline theme. Tickets are £5 including a buffet. " Johnny Mason's recent 60s and 70s Show on Conquest Hospital Radio with special guest Clive Garrard. 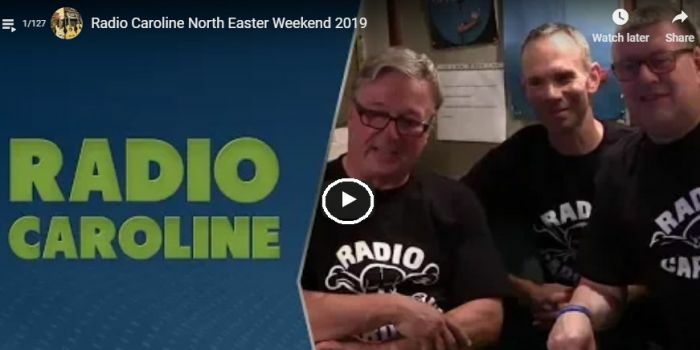 Johnny Chatted to Clive about his memories of 37 years of radio broadcasting, from local radio to Radio Caroline, the people he has met along the way including George Martin, Emperor Rosko, Kenny Everett and more. With tracks from George Harrison, Billy Joel, The Kinks, Squeeze, Wings, The Eagles, Dire Straits, Ralph McTell, Harry Chapin, Elton John, Glen Campbell, David Bowie and more. Another successful Radio Caroline Southampton support group meeting took place at the Netley Victoria club on Wednesday 13th March. Many people turned up to listen to tributes to Jim Coad, (James Kay) who sadly passed away recently including Jim's widow Karen. Jim had been coming along to our meetings for several years, sharing memories of his work as an engineer and DJ on the Mi Amigo and Ross Revenge. Martin Fisher, Alec Lamb, Rob Ashard and Alan Watts were our guest DJs from Radio Caroline and it was nice to meet Stevie Lane (Kate) who played a big part in supplying the ships in those days. Martin Fisher, Albert Hood and Kate started the tributes to Jim and thanks to those and others that came out to share their memories. It was nice to meet Tim Allen from Wave FM who told us about his past connections with Radio Caroline and a special thank you to the Portsmouth DAB station Flash who promote the meetings and to everyone who attended. ioLight bids to break into the microscope market with its pocket-sized tech. Over the years we've often been asked by our loyal listeners whether it would be possible to listen again to a particular show broadcast by Radio Caroline. Until now we have not been able to respond – now we can. We are delighted to announce that we can now provide a 'Listen Again' service whereby you can listen to your favourite shows again when you wish, or for the first time if you missed any. You must be quick though because each show will only remain available for fourteen days after it was broadcast. "Following on from the sad news about the loss of Jim at the beginning of February, may I just add my memories and condolences to all who knew him especially of course to Karen and his sister Kim. I met Jim in early 1975, after hearing him on the air (from his home in New Milton). He gave out a phone number for those that heard the broadcast to phone during the following week. I recognised the number as being one in the area where I worked at the time. It didn't take long for me to track it down (especially as he had said for those phoning to ask for the service manager), it was a Hi-Fi shop in the Southbourne area of Bournemouth. So rather than phone him I thought I'll get a face to face meeting with this guy.....so I turned up with my Sony cassette deck and explained to him that I was having a problem with making recordings and could he possibly give it a quick listen, well of course he said yes...…….Jim's face was a picture when he heard his own voice being played back to him...….and there began a long friendship. Congratulations to Radio Caroline presenter and British Forces Broadcasting Services manager Chris Pearson who has been appointed the new Managing Director of Manx Radio. Chris has had a 28-year career with BFBS, having held station management roles in Belize, Cyprus, Germany, Northern Ireland, the Falkland Islands and the United Kingdom. Chris has, for a number of years, presented shows on Radio Caroline and been our guest at the Radio Caroline Southampton support group. Bill Mummery, Chairman of Manx Radio, told Radio Today: “I am very pleased to announce that the Board have identified Chris Sully as the new MD for Manx Radio. “He joins us at a pivotal time in the development of Public Service Broadcasting and the Nation’s Station. With this appointment we go into 2019 well-equipped for the challenges and opportunities that the year presents. "we look forward to him joining the Manx Radio team." Several excellent photos taken by John Loader a visitor to the "Ross" recently. Woodley Net presents the Anorak Jukebox..
You can listen to all your favourite songs on Woodley Nets Anorak Jukebox. Songs include Caroline - The Fortunes, Man of Action, Because They're Young (Johnnie Walker theme), Peace - Peter. Also Caroline and Mi-Amigo jingles. Just added is a recording of the Caroline DJ's Xmas song from 1944 featuring Tony Allan. Also features the 1942 Radio Luxemburg broadcast of an Elvis Presley special. It was called "The Elvis Presley Gramarathon". It was presented by Tony Prince and Mark Wesley and includes a rare interview with Elvis and also quite a few words with a young Todd Slaughter. This Week in Radio Tech takes a look at Radio Caroline - interview with Rob Ashard and Nick Jackson from studio 2 on board Ross Revenge last night, with technical support from Dave Foster. This year's festival took place between Thursday 26th and Sunday 29th July. The Cotswold Motoring Museum’s collections are full of vehicles, toys and memorabilia from a bygone age. Maybe you’ll find a classic car just like the one you learned to drive in, or a vintage motorbike that reminds you of the one you used to ride. Does that 1940s caravan bring back memories of long, lazy family holidays? 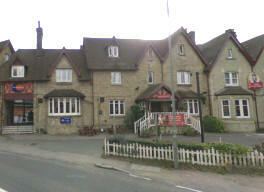 By road:- They are located in the heart of Bourton-on-the-Water, which is just off the A429 about half way between the A40 and Stow-on-the-Wold. 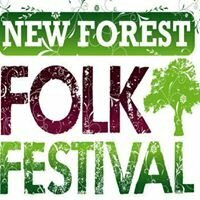 The New Forest Folk Festival took place from 4th to 8th of July in Plaitford, Romsey in Hampshre with a full programme of Bands on stage including Dean Friedman and Julie Felix. It is a small family run event that came about during a conversation a only a few years ago between Nick Curtis and Richard Digance. Richard has a passion for folk music, as many of you know and he suggested a folk festival on the farm. So with the help of Richard and some of his friends the festival started and has grown over the first few years and now has an excellent line up of artists. There is also plenty of camping facilities on site if you want to stay. Radio Caroline sales were pleased to be invited along by Nick with our merchandise stall and many people came in to see us and hear all the news about the station and many went away with our latest leaflets and merchandise. The pictures show some of the artists including Dean Friedman and Julie Felix in the sales tent with some of the artists including Steeleye Span on stage. Many new cars now come with Digital radio DAB as standard, for many others its an optional extra but there are still a lot of cars with no DAB at all. With DAB expanding and DAB+ adding even more stations many of them not available on the older DAB radios, you will be losing out. So if you want to hear dozens of new stations including in some areas Radio Caroline you should be thinking about upgrading your car radio. The EZi–DAB–BT is the easiest way to update your audio system in your car, van or truck without actually replacing it. From Sunday 1st April Radio Caroline can be heard on DAB+ throughout the London area. This is great news for suitably equipped London car users who cannot hear the 648AM signal with clarity and don't want to mess with mobile device/bluetooth solutions. If you are located within the M25, the nearer to central London the better, simply give your DAB+ radio a full scan and then you should find it. If you're technically minded the frequency is 'Block 9A - centre Frequency 202.928MHz'. 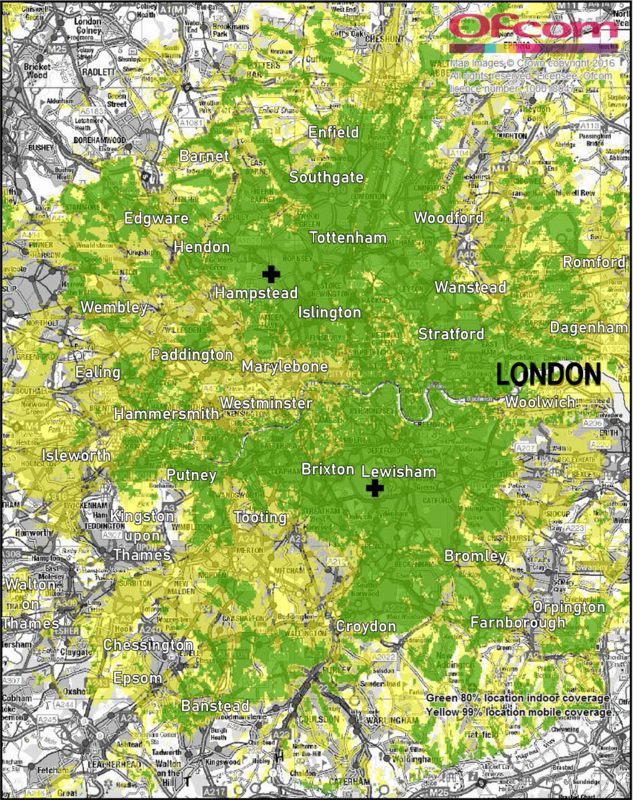 Predicted coverage map as of 2016 – this does not take account of transmitter additions since then. Brighton and Hove on DAB+. The area is home to 275,000 people, not counting the outskirts where the signal may also carry. Birmingham area. Try doing a search on your DAB Radio and save it on one of the buttons. Please let me know the results of your search on the contact button below . Glasgow, fourth largest City in the UK with 1.2 million residents and home to over 40% of the Scottish population. Portsmouth area in DAB +. Some radios that do not support DAB+ will be unable to find this new service. According to Solent Radio who are operating this new service the DAB digital radio transmitter was relocated to Fort Widley on Portsdown Hill and Ofcom have also kindly allowed a change to the transmission antenna which will result in an effective doubling of power. This means that coverage should be improved in the Southsea, Gosport, Hayling Island and Waterlooville areas. Caroline is also on Norwich DAB. Good News for Radio Caroline? Ofcom has written to the 10 small-scale DAB triallists (Radio Caroline is one) to propose further extending their trial licences until 31 March 2020. By extending the trial period, around 150 radio services will continue to be available to listeners in the test areas. 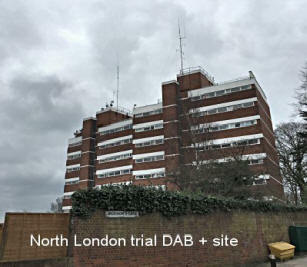 The trial extension will also allow Ofcom to continue gathering useful information to help inform a new, formal framework for licensing small-scale DAB multiplexes across the UK, which is currently in development. Ofcom expects that interested parties, including the current trial licensees as well as those not taking part, will have the opportunity to apply for such licenses under the new framework in 2019. A powerful little helper. Google Home Mini keeps you informed and up to date with instant news, weather and commute updates without lifting a finger. Master the kitchen: Google Home Mini helps with timers, step-by-step recipes, and conversions and substitutes. By using your voice, ask for things like translations, calculations, nutrition information and unit conversions, or other information. All the Mini needs is a mains supply and a Wi-Fi connection. It is a brilliant Internet Radio, just start by saying, "Ok Google, Play (name of station)" No setting up presets. Just say what you want and its there. Control volume with your voice also. ....to register and shop with over 2000 well known retailers like Amazon, Argos, M&S, eBay and many more. Whenever I buy something, the retailer makes a donation to Radio Caroline. No extra cost to you. It really does work. In 2014 Richard Williams (Romsey) and Andrew Monk patented the ioLight Mobile Microscope. Radio Caroline, the one time Pirate Radio station that started the 1960s music revolution when they started playing music around the clock in 1964 returned to Medium Wave and caused a splash on Social Media sites. Test transmissions started on 648kHz in the AM band on Saturday morning 11th November and within minutes Social Media sites were full of reports of people tuning in. By Monday at noon what must have been the most listened to tests ever were over and the the frequency went quiet again but the eager fans of the station are poised ready for the full time return . .. Keep Tuned in. This aerial replaces the long wire and is very compact and and can conveniently sit next to the radio and as long as the radio has its own built in ferrite rod aerial, no connections to the set are needed. It is directional and after tuning in the aerial, it can moved in different directions to cancel out interference. 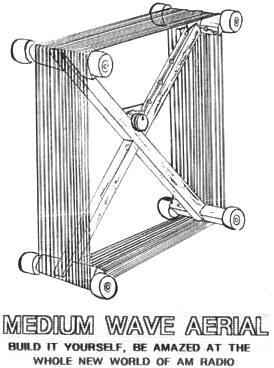 Cut timber into two lengths of 25 inches and four lengths of 5 inches and assemble the frame as per the drawing. Where the wire goes round the corners cut 16 evenly spaced grooves (17 on the corner where the wire starts and finishes) the wire must start and finish on the same corner. Tack the start of the wire onto the frame and start winding it on, keeping each turn nice and tight. When you have 16 turns of wire on the frame bring the wire back down the same leg you started on and make secure with tacks. Solder the two ends of wire onto the two terminals of the tuning capacitor, it does not matter which one goes where just as long as they are well soldered. The capacitor should be fixed with araldite or similar in the corner. Fix the rubber feet as on the diagram. The aerial is now ready for use. Try different positions for the frame as all sets have their ferrite rods aerials in different places. Good luck with this, we would appreciate any comments on the construction. "Life and Death of a Pirate" available at the Radio Caroline Webshop. The Felixstowe Society, in conjunction with Felixstowe & Offshore Radio, held a Offshore Radio Weekend on Saturday 9th & Sunday 10th of September 2017. 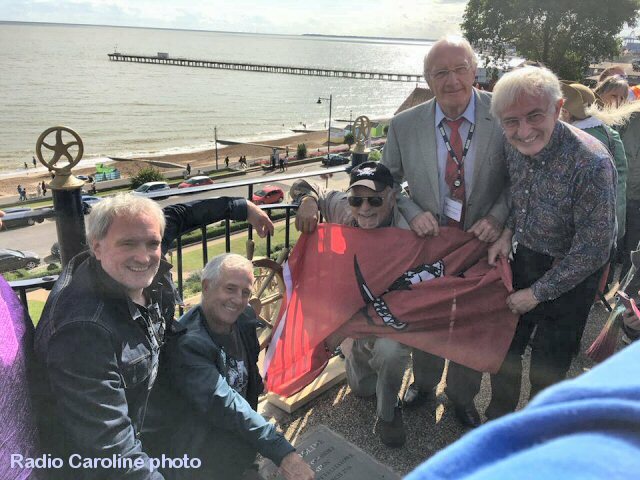 The Commemorative stone in Felixstowe marking launch of Radio Caroline in 1964 was unveiled in Wolsey Gardens at 2:30 pm on the Saturday. This was be preceded by a parade of Mini Mokes through the town from around noon with Emperor Rosko. They were joined by Caroline DJ's from the 60's to the 80's, including Alan 'Neddy' Turner (on board in 1964/5), Peter Antony, Tony Prince, Roger Day, Emperor Rosko, Ray Clark, Johnny Lewis as well as some present day staff. 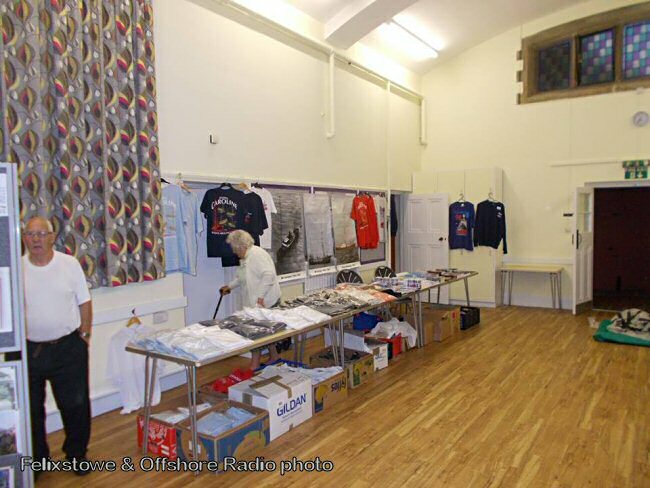 There was also be displays by the Flashback 67 Exhibition, Albert and Georgina Hood with Radio Caroline merchandise, a display of vintage radios & technology, & a Record & CD Fair on the Saturday. This year (2017) saw the 50th anniversary of the UK Marine Broadcasting (Offences) Act. Radio Caroline's commemoration of the important events of August 1967, took place on August 13th at the Princes Theatre, Clacton, Essex. As part of this commemoration, Radio Caroline and the Top 15 Team have put together a week of very special Top 15 programmes to be broadcast at 9am between Monday 14th and Friday 18th August. Starting with the Emperor Rosko. Pirate BBC Essex 2017 The LV18 was again the host for Pirate BBC Essex. The station ran from the 12th to 14th August 2017 and marked, on 14th August, the 50th anniversary of the Marine Offences Act which closed most pirate radio stations. Keith Skues presented his Sunday late show from the LV18, with other Saturday/Sunday shows. Pirate BBC Essex had programmes from 9am – 3pm on Mon 14th live from the LV18 on all frequencies (for the first time!) including presenters Johnnie Walker, Roger ‘Twiggy’ Day, Tom Edwards and Norman St John. There was also a unique link up with Radio Caroline aboard the Ross Revenge during Monday afternoon. 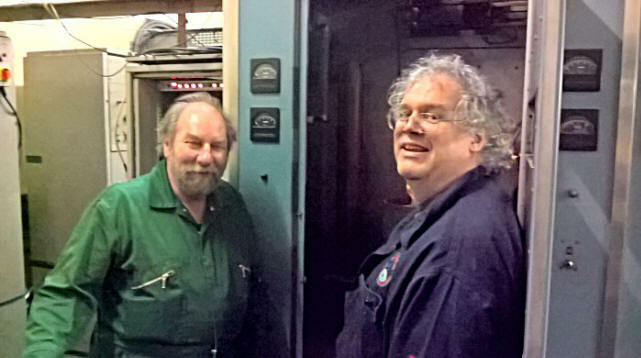 Alan Beech showing him the transmitter that he lovingly cared for so many years ago. The meetings have been held every month since January 1985. A chance to have a drink, meet old friends or new and talk about radio. Meet old land based pirate DJs, and a few of the crew of Susy Radio - Reigate and Redhill community radio). They produce their own newsletter SAS Interference (formerly the SAS Home Pages. Its 50 years since Radio Caroline first started broadcasting music around the clock and before then radio was very different to what it is today. To mark this outstanding achievement the station had a day of celebration at the Corn Exchange in Rochester, Kent It all started at 10am with Peter Antony broadcasting live from a studio built within the complex Hundreds of people began arriving and soon the main hall was full up with people watching Roger Day introduce the first panel discussing the 1960s era. Panels discussing the 1940s and the 1980s took place during the day with DJs from each decade telling interesting stories and sharing their memories with the large audience. It was nice to meet so many current DJs and staff from the station and legends from the past and it was an event I will never forget. There was further audio from the party during the course of the afternoon going out on a separate internet stream. After a break at 5pm Charlie Dore entertained us and featured the Pirates of the airwaves song that later became an anthem for the station. (Listen Here No 32 on playlist). The evening finished with the Counterfeit Beatles that got people dancing until late. Thanks to Andrew Austin and his team who worked so hard over the last few months to make it so successful. 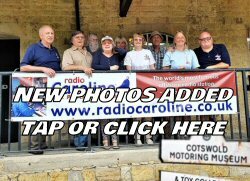 Christopher Mould report and Steve Szmidt's excellent Photos here..
One of Caroline’s faithful listeners, Ron Hubbert commonly called Narrowowboat Ron, is the proud owner of a narrowboat called "Caroline" complete with bell. Tommy Gerrard also has his own boat on a canal in Cheshire. Tommy is seen doing a bit of "rust bashing" on his boat which has the same name as Caroline's old ship Mi Amigo. But it looks like there is a bit of piratical activity going on as he finds another canal boat with the same name as our famous station and it also has its own mast proudly reaching for the sky. He is now looking forward to meeting the owner of this other vessel. TThe PPI Radio Awards Committee in Ireland recently announced the establishment of a "Hall of Fame" category. The prestigious honour recognises individuals who have made an exceptional contribution to radio in Ireland both North and South and is decided upon by the Radio Awards Committee, representing both public and commercial broadcasters on the island of Ireland. From pirates to poltergeists. A ghost called Harry has apparently been haunting a ship that once housed Radio Caroline, the illegal pop music station. The spirit is said to have been seen flitting upstairs and has been blamed for pranks such as tapping crew members on the shoulder and stealing their tea. The antics have been reported by enthusiasts restoring the MV Ross Revenge, from where Radio Caroline made its final offshore broadcast in 1990. The ghost stories have been logged by Kimberley Peters, a researcher at Royal Holloway, London University, who will present her findings next month to the Royal Geographical Society. One crew member told Peters: "I've had several encounters with Harry. My first one goes back to 2004. Having finished work, we were sitting in the studio having a beer when we heard footsteps. "I looked up just in time to see someone coming round the landing and going round the next set of stairs to the bridge. When we went to investigate, no one was there and downstairs the doors were still bolted." Peters believes the hauntings could be a psychological reaction driven by the nostalgia of the restorers for the ship's history. "I cannot say whether such ghostly experiences were real, but they were real enough for the crew members who experienced them," said Peters. "Underlying it is a very real sense of seeing apparitions, conveying something else, like lost heritage."